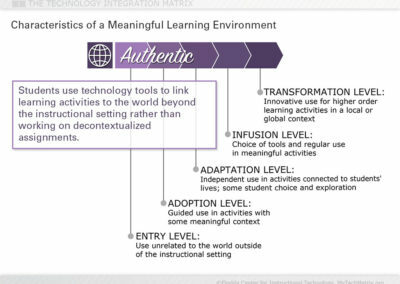 Students use technology tools to link learning activities to the world beyond the instructional setting rather than working on decontextualized assignments. 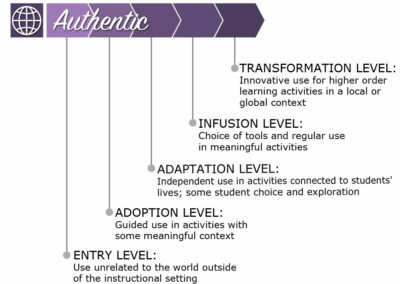 The Authentic characteristic involves using technology to link learning activities to the world beyond the instructional setting. 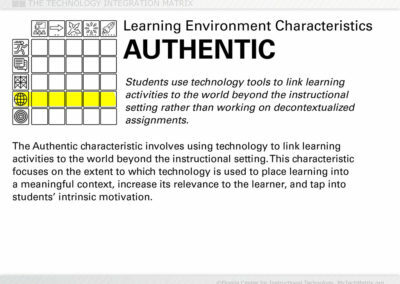 This characteristic focuses on the extent to which technology is used to place learning into a meaningful context, increase its relevance to the learner, and tap into students’ intrinsic motivation. 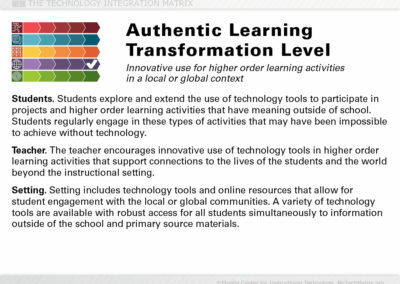 This page provides greater detail about the Authentic learning characteristic of the Technology Integration Matrix. 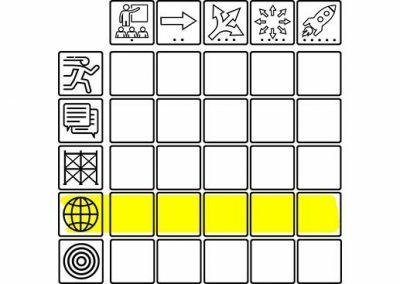 To see the entire matrix or to locate other characteristics, return to the Matrix. 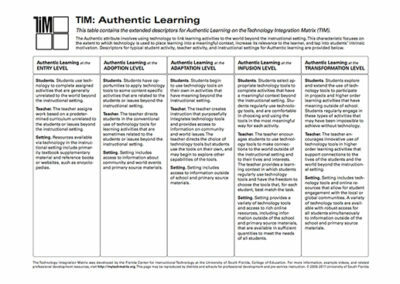 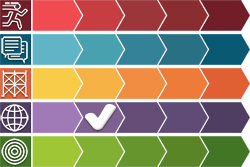 Descriptors for typical teacher activity, student activity, and instructional settings for Authentic learning are provided below, along with links to all of the Authentic learning video lesson pages and additional resources. 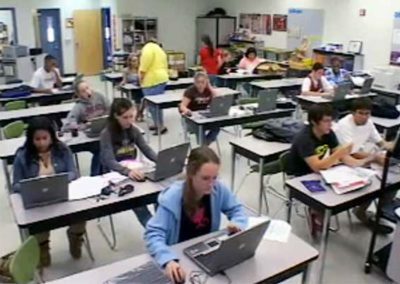 Students use technology to complete assigned activities that are generally unrelated to the world beyond the instructional setting. 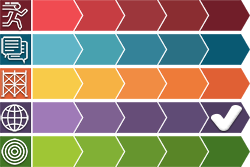 The teacher assigns work based on a predetermined curriculum unrelated to the students or issues beyond the instructional setting. 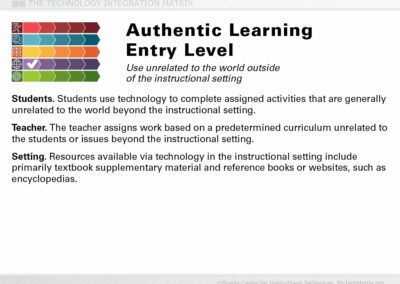 Resources available via technology in the instructional setting include primarily textbook supplementary material and reference books or websites, such as encyclopedias. 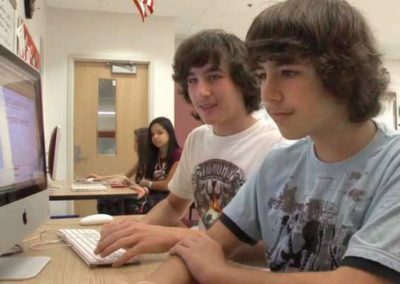 Students have opportunities to apply technology tools to some content-specific activities that are related to the students or issues beyond the instructional setting. 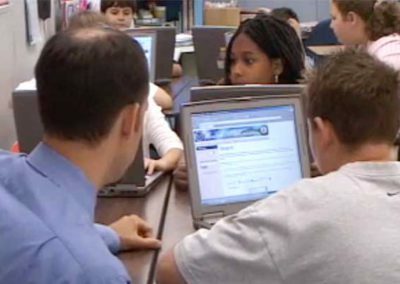 The teacher directs students in the conventional use of technology tools for learning activities that are sometimes related to the students or issues beyond the instructional setting. 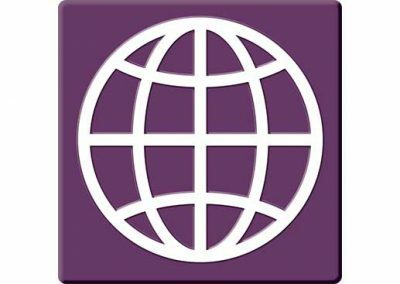 The setting includes access to information about community and world events and primary source materials. 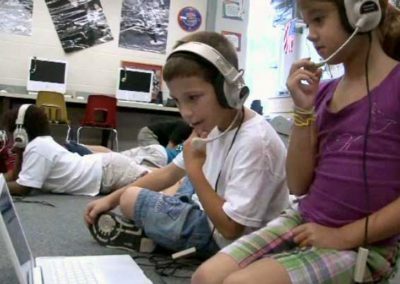 Students begin to use technology tools on their own in activities that have meaning beyond the instructional setting. 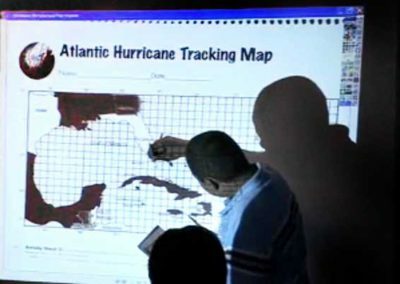 The teacher creates instruction that purposefully integrates technology tools and provides access to information on community and world issues. 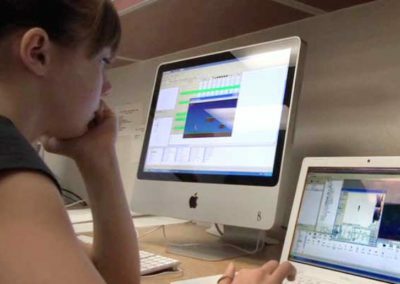 The teacher directs the choice of technology tools but students use the tools on their own, and may begin to explore other capabilities of the tools. 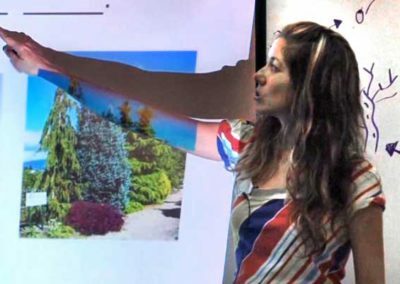 The setting includes access to information outside of school and primary source materials. 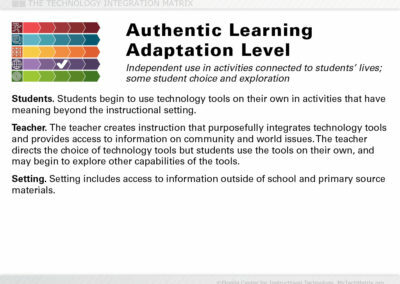 Students select appropriate technology tools to complete activities that have a meaningful context beyond the instructional setting. 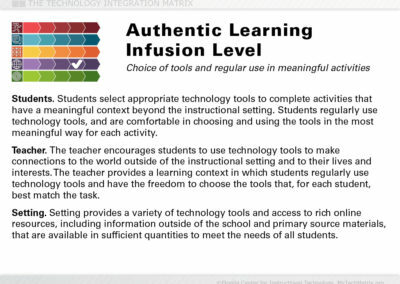 Students regularly use technology tools, and are comfortable in choosing and using the tools in the most meaningful way for each activity. 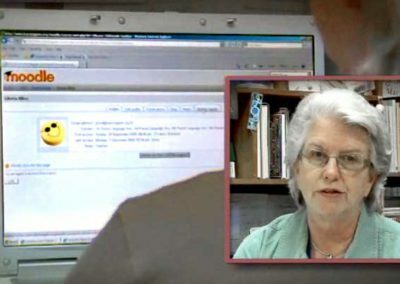 The teacher encourages students to use technology tools to make connections to the world outside of the instructional setting and to their lives and interests. 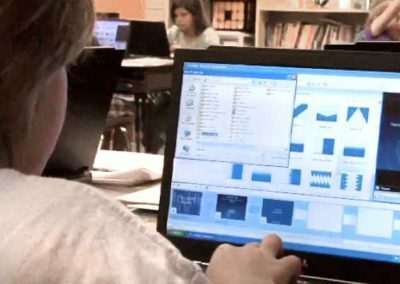 The teacher provides a learning context in which students regularly use technology tools and have the freedom to choose the tools that, for each student, best match the task. 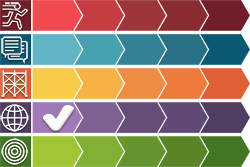 The setting provides a variety of technology tools and access to rich online resources, including information outside of the school and primary source materials, that are available in sufficient quantities to meet the needs of all students. 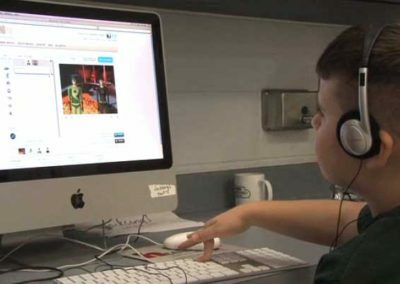 Students explore and extend the use of technology tools to participate in projects and higher order learning activities that have meaning outside of school. 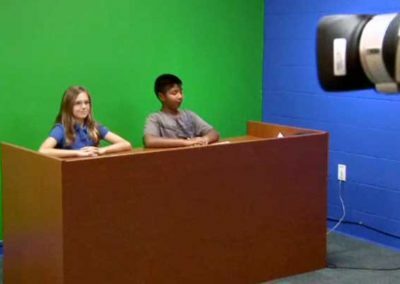 Students regularly engage in these types of activities that may have been impossible to achieve without technology. 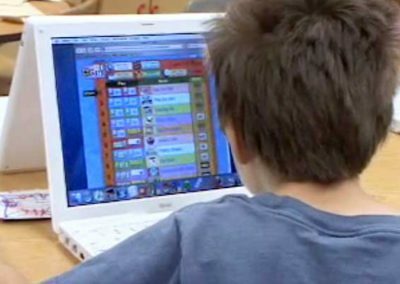 The teacher encourages innovative use of technology tools in higher order learning activities that support connections to the lives of the students and the world beyond the instructional setting. 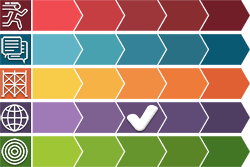 The setting includes technology tools and online resources that allow for student engagement with the local or global communities. 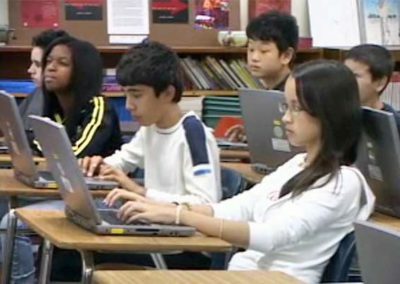 A variety of technology tools are available with robust access for all students simultaneously to information outside of the school and primary source materials. 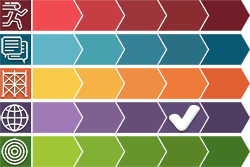 Can Acids and Bases Remedy the Body?